The alleged abduction of a prominent Peliyagoda businessman by two men in camouflage military uniforms this morning has resulted in protests in the area. Family members said Lalith Kumara was a businessman who owned three fisheries outlets in Dematagoda and Peliyagoda. They alleged that he was abducted at around 5.30 a.m. while travelling in a lorry to Peliyagoda accompanied by one of his employees. The 41 year old businessman is also the President of the Dematagoda Fish Traders Association. Mr. Kumara’s daughter Achini Subashini said her father had left home at around 5.30 a.m. in the morning to his fish store in the Peliyagoda Fishing Complex. She said that according to the employee who was with her father, they had been followed by two men in camouflage uniforms and had overtaken the lorry which was driven by my father and had suddenly put up a signboard with the words Stop. “When my father had wanted to show his driving license the two men had told him there was no need but to get out of the lorry,” his 19-year-old daughter said. “The employee was locked up in the lorry and as such had not seen how my father was taken away. When asked whether they could think of a motive for the abduction, she said her father has not done anything wrong and was admired by everyone in the area. “So I am not able to think of any reason behind his abduction,” the daughter said and added that she had neither received any calls demanding a ransom. 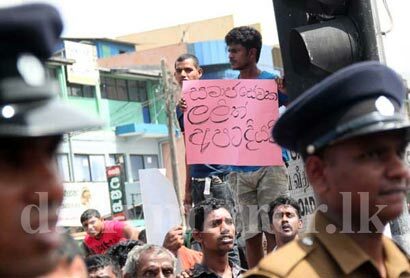 The family members had complained to the Dematagoda and Grandpass police and in the wake of the abduction the members of the fish traders association had staged a protest at the Dematagoda junction for nearly three hours. “We have a lot of relatives and supporters from Orugodawatta to Dematagoda and from Orugodawatta to Grandpass and they are shocked by what happened. We hope that the police will be able to find my father soon,” she added.